I’m always on the lookout for a bargain basement gem, but they’re not very easy to find. So I decided to look at two newer releases from Couvent des Minimes, a brand with a very solid line of body products and one cult favorite fragrance, the boozy vanilla Eau de Missions. Their latest creations are Eau Aimable (or Cologne of Love), and Matines (or Cologne of the Morning). One of them is worth trying if you’re looking for a bargain floral. Botanical Cologne of Love gives a feeling of well-being and serenity. [¶] Thanks to its Original Recipe combining Orange Blossom, a source of softness, with 5 Plants selected for their beneficial properties, this exquisite, sparkling, scented water perfumes the skin with a soft and soothing fragrance. The skin is fresh and perfumed, the body is enveloped in softness. 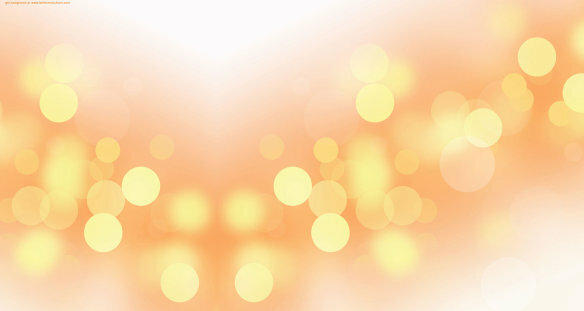 Cologne of Love opens on my skin with a translucent, billowy, but strong cloud of orange blossoms and cream, laced with a streak of lemon blossoms, then drizzled lightly with honeyed water and bits of mandarin pulp before being wrapped up in a crisp, clean cocoon. There is white musk, but not too much (at first). The predominant sense is of fresh, non-indolic, budding flowers growing in nature, splattered with bits of their fresh fruit. It’s almost like being in an orchard where the majority of trees are orange, but there are just enough lemon ones to give Cologne of Love the aroma of both flowers. I have some orange trees in my garden mixed in with a few Meyer lemon ones, and Eau Aimable replicates their combined aroma when in bloom perfectly. What I like about it is that the airy flowers are very sweet without being painfully gooey, cloying, or drenched with jammy thickness. I’d say the orange blossom skews green like neroli, but that wouldn’t be wholly accurate, either, because the flowers are almost candied, warm, heady, and drizzled with nectar that feels like honey water. The overall result has a refreshing brightness and naturalism without ever being overly crisp or clean. The discontinued Orange Blossom sorbet or soufflé. Source: eBay. 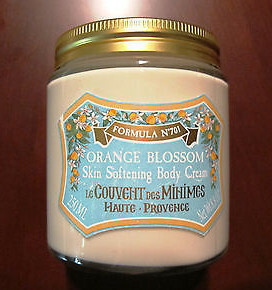 What Cologne of Love really smells like is Couvent des Minimes’ old, discontinued orange blossom body cream. Some of you may be familiar with the product, as it was very popular. It was my personal, all-time favorite body cream, and that was primarily because of the heady sweetness of its scent. I never understood why the company pulled it from production and, later, when they began making colognes, wondered why they never created one that smelt like their most popular products. Now they have, with a whole fleet of matching items to boot. While I think Cologne of Love is wonderful, I still prefer the smell of the cream. One reason is the clean musk which grows excessive for my tastes near the end of the 2nd hour. That said, it’s hardly as over-the-top as some niche fragrances that I’ve reviewed lately and it never smells like the revolting Bounce drier sheets, but I would have been happier without it. The second reason is that the body cream is… well, creamier, as you would expect. The element does grow stronger in Cologne of Love as time goes on but, obviously, it can’t match to an actual cream product. Still, by the start of the 3rd hour, Cologne of Love is an equal-parts mix of sweet orange blossom, honey cream, and white musk, with a ghostly drop of citrus in the back. The honey cream reminds me a lot of the scent of their Shea & Honey product, albeit in weaker form here. Aimable doesn’t develop much beyond this point. The notes merely grow hazy and soft; the white musk fluctuates in strength; the honey turns indistinct; and Aimable becomes a simple, pretty orange blossom floral with cleanness. All in all, Cologne of Love had moderate to soft projection, and rather good longevity for such an airy, light cologne. It lasted 7.25 hours, which was unexpected as my skin eats up floral soliflores with great rapidity even when they are eau de parfums, never mind mere colognes. That said, I think the presence of the clean musk has something to do with it, since my skin retains that note much longer than most. Still, on Fragrantica, quite a few people were similarly surprised by how long the light scent lasted. As for projection, it was better than I had expected. Using 2 sprays from my decant bottle, Cologne of Love opened with 4 inches of projection and wafted a scent trail of about half a foot. Those numbers soon dropped to 1.5 inches of projection at the end of the first hour, and roughly 3-4 inches of sillage. Cologne of Love turned into a skin scent after 3 hours. Orange blossoms via the Pattersonfoundation.org. On Fragrantica, the majority of reviews are overwhelmingly positive. One person thought Eau Aimable resembled Kilian‘s Love Don’t Be Shy, while another found similarities to his Sweet Redemption. I haven’t tried the latter, but don’t really see the connection to the former as Love Don’t Be Shy was a painfully syrupy orange creamsicle on me and not at all naturalistic the way Cologne of Love is on me. I think it will depend on personal skin chemistry. For one Fragrantica poster, Cologne of Love was “bombastically sweet” but she was only turned off it when her boyfriend said it resembled Tang on her skin. Another called Aimable a “lovely… sweet orange blossom delight” that, unfortunately for her, felt purely “gourmand,” would tempt her to eat and be a weight gain problem. Like most of us members of this community, I have a lot of fragrances. Niche, vintage, designer, drugstore. Never tried this brand before [….] But oh… my… Lord… it is really one of the most absolutely beautiful scents I’ve ever smelled. [¶] Paradise. Found. this actually does kind of resemble Love Don’t Be Shy by Kilian! At just a fraction of the cost, I’m SOLD! Of course the sillage may not quite match Kilian, but the Longevity is fairly surprising for a Cologne – even though it keeps fairly close to skin. 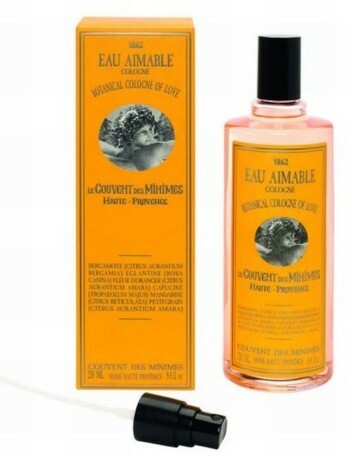 All the reviews for Eau Aimable on the Couvent de Minimes website are positive, as are the 10 comments on Ulta where the fragrance is currently on sale for $28.50 for a 100 ml bottle. That’s a really good deal, though if you have concerns about sweetness levels, I’d recommend checking eBay for samples. I bought my 5 ml decants there. Source: Couvent des Minimes website. Le Couvent des Minimes Botanical Matines Fragrance leaves your skin with a scent of crisp notes of apple that mingle with the freshness of orange, lemon, and basil. The base notes of Woods, Cedar and Soft musk give a feeling of serenity. Suitable for men and women. Apple, pear blossom flowers, mint, basil, cedar, orange, lemon, musk. Matines opens on my skin with apple water turned crisp with cool, chilled lemon, then sprinkled with a pinch of fresh herbs. The latter don’t really smell like either basil or mint, and are wholly indistinct. The tiniest suggestion of woodiness weaves through the background, feeling equally nebulous. Moments later, a gentle, clean sweetness ripples over the scent, smelling like golden pears imbued with floral, clean musk. The pear is a pretty note, but a very elusive one that quickly vanishes to the background where, once in a while during the first 5 minutes, it will show its face besides the cedar. The clean musk remains, alas, growing stronger by the moment. Matines’ undistinguished, generically pretty start is intangible and fleeting. 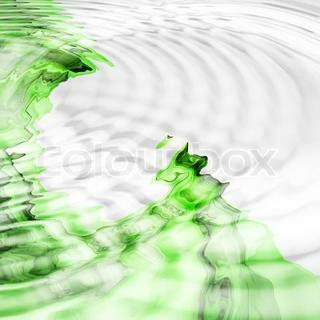 Within minutes, the apple is clobbered by the musk; the lemon turns hazy; the basil vanishes; and all the remaining notes are swallowed up by a wave of Bounce-like laundry cleanness. Less than 10 minutes in, Matines is a generic, synthetic “fresh and clean” bouquet that smells extremely close to a Febreeze fabric and room freshener that I own. Matines is virtually indistinguishable except for a heightened degree of abstract citrusy crispness (that feels quite sharp) and a wisp of fruitiness. 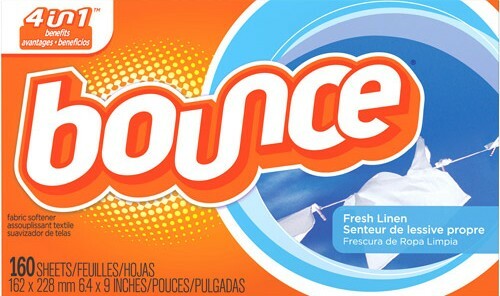 Less of a clone but equally similar is one floral version of Bounce drier sheets that I have in my laundry room. It’s that utterly indeterminate, vaguely floral-ish, vaguely fruit-ish, vaguely citrusy crisp bouquet that abounds everywhere but lacks any characteristic other than excessively industrial cleanness. 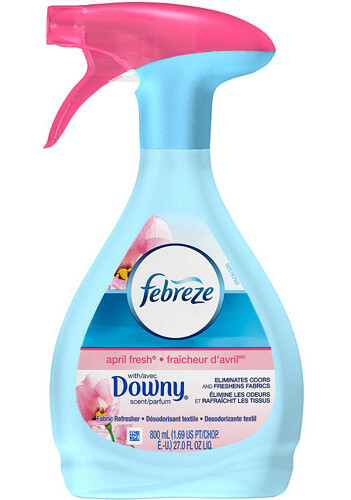 Sadly, my Febreeze smells smoother and more pleasant than Matines. Matines never changes from its artificial crispness. All that happens is that the white musk turns high-pitched and shrill before a sliver of creaminess arrives near the end of the 3rd hour. For a little while, it alleviates things (to a small degree), resulting in a creamy-ish floral musk with a hint of citrus. Then, things turn south again at the start of the 5th hour, and Matines turns into a pure laundry aroma that is indistinguishable from Bounce drier sheets. It finally dies away an hour later. All in all, Matines lasted just short of 6 hours on me, but I suspect that is solely attributable to the fact that my skin chemistry retains white musk longer than most. I assess fragrances on a sliding scale of criticism. One simply cannot judge a low-end or drugstore brand by the same criteria used for mid-range niche scents, let alone something from Roja Dove, Amouage, or SHL 777. It would be ludicrous, not to mention unfair. But there is nothing to Matines that stands out in terms of scent from what you could find at any drugstore. I think it has even less character than a more affordable $14 Bath & Body Works spray, and certainly feels cheaper than some things from Victoria’s Secret. Well, I’m happy it works for her as an air freshener. I personally don’t think that is a very positive recommendation for perfume, not for $38, not for €28,50, or for any price at all. One might as well buy Febreeze. One of its varieties is virtually the same scent, but for $30 less. My advice is to avoid Matines at all costs, but give Eau Aimable/Cologne of Love a sniff if you like neroli and orange blossom in a sweet, creamy bouquet. Cost & Availability: Cologne of Love and Matines are both colognes that come in 3 sizes with accompanying body products. The 3.4 oz/100 ml bottle costs: $38, €27 (sometimes €28,50 at some European retailers), or £19. There is also huge 8.4 oz/250 ml bottle for $48 or €37, and a truly enormous 16.9 oz/500 ml vat for $69 or €48. All the bottles are splashes that come with an accompanying atomizer spray. In the U.S.: Couvent des Minimes sells Cologne of Love in all 3 sizes, along with accompanying body products, but Matines is only shown in the 100 ml size. Ulta sells both Aimable and Matines in the 100 ml size, along with some body products. Aimable is currently on sale on Ulta for $28.50 which is $10 off. Amazon has Aimable at regular price, as well as a gift set. I don’t see Matines. You can often find decants or samples of both scents on eBay. Outside the U.S.: Canada’s Shop Style sells the line via Drugstore.com, and shows Cologne of Love but not Matines. Drugstore.com is sold out of Love at the time of this review. In the U.K., the British Couvent des Minimes website has Aimable and Matines. Boots sells both on their website as well. 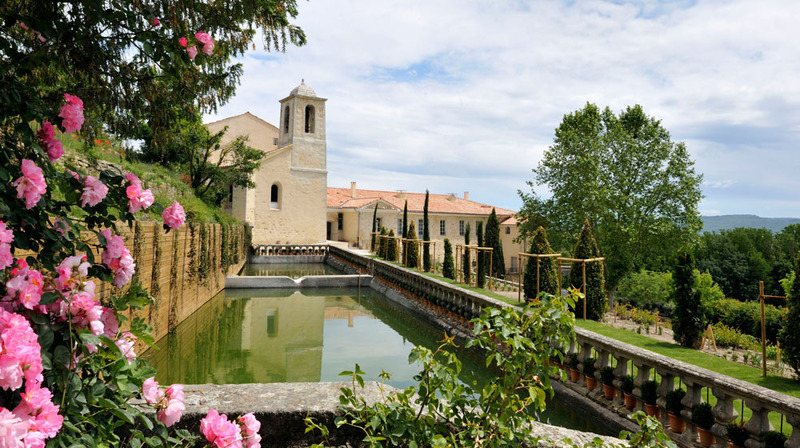 In France, the French Couvent des Minimes website has Aimable and Matines, or you could buy them at Marrionaud. In Germany, Budnikowsky and Muller reportedly carry the line. For all other countries, the Couvent des Minimes Store Locator Guide lists locations in Europe, Australia, and Brazil. If your country is not on the list or is outside Europe, your best bet is your local Boots store. The main Boots website also offers shipping to a wide variety of countries from the UAE to Thailand, Greece, Qatar, Saudi Arabia, Kuwait and more. Go to the top of the page, click on “Shipping,” and you’ll be taken to the appropriate site. Samples: I bought my decants on eBay. Surrender to Chance does not carry these two. This entry was posted in Citrus Aromatic Fragrances, Couvent des Minimes, Florals, Perfume Review and tagged Apple fragrances, Clean citrus musks, Cologne of Love, Cologne of Love review, Couvent des Minimes, Couvent des Minimes Cologne of Love, Couvent des Minimes Matines, Eau Aimable, Eau Aimable fragrance review, Eau des Matines, fragrance review, Matines fragrance review, orange blossom fragrances, Pear blossom by Kafkaesque. Bookmark the permalink. I have been trumpeting the merits of this little cheapie for about a year now, because honestly it’s SUCH a bargain! (And you don’t have to put up with all the “Oooohhh!! It smells JUST like…(insert name) but at 1/350th of the price!! !”) I love Cologne of Love ice cold from the fridge, on a hot summer’s day it’s super refreshing! Very happy that my back-up 100 ml. has it’s OWN back-up, because one of these days Couvent is going to wise up and jack the prices. Did you check out their Italian resort/spa website. Looks amazing! Providential post! I had just yesterday pulled out the last half-bottle of the old Orange Blossom shower gel (my body cream is long gone) and wondered if anyone made anything in a similar scent and why the heck they were discontinued in the first place. Glad to know I have something to look out for. Lovely review, Kafka. I loved Eau Aimable as Well and bought 500 ml for 16 euro ! It Will replace Atelier Cologne Grand Neroli when it is very warm. The Couvent scented candles are great as Well btw. I have never seen or scented THE body Cream but it must smell amazing. Nuns should smell of piety not vanilla …non? If you have an Ulta near you, check the Clearance items. I scored a bottle of the Eau Aimable Beneficial Care Oil for $4.00 and change and it is lovely and perfect for layering with other Orange Blossom or Neroli centric fragrances. I use it with John Varvatos Artisan which many of us find fleeting, it anchors it for a longer wear time. Oh I loved that Orange Blossom body cream, so sad it was discontinued. I have Cologne des Missions, which is nice, but not a dupe of SDV for me. I wear it to bed when I am in the mood for vanilla. Need to try Eau Aimable. Are pear blossom flowers different from pear blossoms? Eau Amiable is lovely in the oil form and I didn’t the musk note stand out in that variation. I am just glad I am not the only person who remembers the cream from years ago. I was glad when they finally made their presence again known in my region.